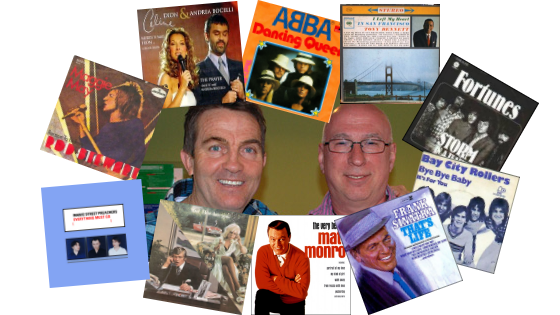 Each day for a week (Monday 10th - Friday 14th May 2010) Bradley Walsh picked his favourite musical tracks, and commented on their meaning with Ken Bruce on BBC Radio 2. The reason I chose this, whilst I was working for Rolls Royce up in Leavesden in Watford which is now ironically a film studios - it's where they make the Harry Potter films. I was an apprentice jet engineer, a sheet metal worker, I used to work on the small engines for helicopters, and I also played in the Rolls Royce Saturday side football, and the Sunday side. After every match we would all then congregate in the Sports and Social Club and we used to drink copious amounts of beer. We were called the "PILS" club because there was a certain drink that we would all drink it was sugar free or whatever it was and consequently we would see how many bottles we could put on the table. At the end of the night our record would be revalidated by the head steward of the club - it's pretty childish activity but nonetheless it's just blokes playing football. Rod Stewart was a big big hero of all of ours, this song in particular "Maggie May" was just extraordinary, we would all then try and climb up onto the tables and sing it. Vic McGregor who was the steward at the time, he's now no longer with us, Vic bless him, he became a great friend of ours, but he would just let us run riot in the club because we was keeping it open. All the old fuddy-duddies, and oddly enough I say that, but if I had sat in that club now and people would be doing that I would say "get them down of that table, what are they doing up there?" where as I as a young man of the age of 16 and 17 playing football, it was wonderful times. A fantastic memory, and all the lads that were in that "PILS" club, and the football team will remembers us doing all that. This particular song is just a wonderful, wonderful tune. It's a great song sung by two wonderful singers and I was very fortunate to have met Andrea Bocelli, we worked together on a Royal Variety Performance. I sat in Andrea Bocelli's dressing room with him whilst he sat, played a bit of piano and was having his hair cut, it was extraordinary. He signed, despite as everyone knows his blindness, his CD's for me as I'm a massive fan, and I love classical music. I was just bowled over, he was the nicest man and a great, great singer, and awe inspiring and so this song is just one I really, really love. I just think the two voices together are just something that is quite extraordinary. No matter when it starts you know you can't help your legs, there is no stopping it, even I dance to this. I think it is a fantastic track and I just think they are all a wonderful, wonderful band. Oddly enough I never felt embarrassed about being an Abba fan ever, and at last being inside that closet, everyone else is trying to cram themselves inside there as well now and I'm shutting the door. I just think that they are a wonderful, wonderful band and did wonderful things musically. I'm so pleased that they have been revered as much as they have. I once went to a gig, an after dinner party thing, I asked the DJ to play Dancing Queen, everyone was leaving and stuff, but all of a sudden Dancing Queen came on and they all danced again, so I said to the DJ could you play it again? He said "what again!" I said, yeah, please play it again, so he started playing it again, nine or ten times he played, the party went on for an extra half hour. It was just dancing to Dancing Queen, it's a fantastic track I love it. I was doing a gig in Ringmer which is near Lewes in Sussex, I was just doing stand-up comedy then so I was travelling around on my own, my mates had abandoned me, my mates used to come with me to all my gigs in the beginning, they used to think this is great, this is fantastic, what a life, on the road smashing, after about a month they went, life on the road, your kidding, this is just a joke. I used to travel on my own, I remember speaking to my aunt, she said why don't you play some tapes in the car? I said I will I've got some Sinatra, and whatever I had, and she said why don't you listen to this - Tony Bennett, "It sounds just like Frank Sinatra, it's the same thing". She said "absolutely not", and since that journey to Ringmer and back, Tony Bennett is my favourite singer of all time, and I'll be honest with you, I would have chosen all Tony Bennett tracks, I seriously would given half the chance, because I'm just a massive, massive fan. If I remember correctly this is the first record I ever brought. I used to play it at home when I used to live in a road called Ganders Ash, great name for a street, in Leavesden, Watford. I went out and brought this record because I just thought it was wonderful, and a great catchy tune, and written by Lyndsey Rubin who is Lynsey De Paul, I didn't realise at the time, and I worked with Lynsey in a Panto years and years ago up in Oxford and I said to her at the time, ( I was singing it at the time) it's my favourite record, I bought it as a kid, and she had a big smile on her face, what are you smiling at? She said "I wrote it", I went shut up, "No I did, find it". True - I looked and on the cover it's got L. Rubin, and that was her real name. A couple of friends asked me to listen to the Manic Street Preachers, I said I don't want to listen to all that nonsense, it's all too much for me. They said "What are you talking about you're only 36". I then watched a televised concert and they were on and sung it, I went straight out and bought the album, I just thought they were an extraordinary band, it was the first time I heard them and the lead guys voice, just wonderful, and it's a great, great, great song. I used to live in a flat in St Albans Road, Watford with my mate Steve Kelly, his real name's Steve, but everyone calls him Harry, Harry Kelly. My mate Harry used to have this old Morris Minor van, the GPO vans, he used to have one of those, because he was a GPO engineer, it was painted cream. We were chatting these girls up one night at a disco, they said "What do you do for a living?" we said we're in a band and they went "Oh really?" yeah, yeah, really, a band. "What do you do? ", I'm the roadie, "What's the band called?" Off the top of my head I said it's Steve Kelly and the Steve Kelly band, "oh is that a fact? ", yeah. So the next time we saw the girls, to make sure they believed us I took a pot of brown paint and on his van I painted in brown gloss "Steve Kelly and The Steve Kelly band on Tour". What we used to do, up the club after a few drinks, we used to pretend we were this 10cc made up band "Steve Kelly and The Steve Kelly band" with broom handles, we were teenagers, in the mid seventies singing "I'm Mandy Fly Me". What a singer, I have so many of his albums at home. People don't realise what a massive, massive star he was, not so much in England because I guess he was a big, big star in England but people remember him and put him in the same category as Sinatra, but he was a different singer to Sinatra. Matt Monro actually sang with an English accent which is very unusual for standard singers, more to the point he was massive in Europe, and of course this particular song is the lead song to one of the great iconic films of all time - The Italian Job. I remember seeing that film, my cousin and I - and in those day you could actually get on a bus and go and watch a film, no matter how old you were, I think this was 1969 or something. We would get on the 306 from Ganders Ash into Watford go and watch the Odeon cinema, sit in their Saturday morning pictures and watch this film. That stayed with me, that tune, lyrics by Don Brack of course, and Don who I know, hope you're listening Don, it's one of the greatest songs, and by the way Don, if you are listening you did promise to write me a song once. So pull your finger out. A great, great song, and a fantastic film to go with it. This song epitomises everything about a journey through life. Anyone who has been in show business, understands show business, should use that as their theme tune because someone's always, don't know what it is, but they are always waiting to trip you up, someone's always jealous of what you are doing, and what you should do is get on with your own life and stop worrying about anyone, never look back, because if you look back you'll constantly trip up going forward. This is my first foray into doing anything on stage, I played the drums in a school band, we were never plugged in, I just had to learn to play for a school assembly. I had just been in Pirates of Penzances, as the diminutive policeman, and I was the one amongst many and then what happened was I was asked to make a school assembly. I got a few of my pals together and we were in the Bay City Rollers, and we actually had tartan trousers, and everything. My mum was very pleased because my mum is a Scot from Bellshill and I had all the gear. I was behind the drums and so we sang along to this, the school assembly kids went mad for it, I'm talking about 1975, and they just loved it, everyone was coming up after the school assembly saying that was fantastic you should do more of that stuff. I thought Yeah, I quite liked the feeling of being up there and doing that albeit with other people and behind a set of drums, but from then that got me interested into what I'm doing now.